Mecklenburg-Vorpommern (German: [ˈmeːklənbʊʁk ˈfoːɐ̯pɔmɐn], abbreviated MV), also known by its anglicized name Mecklenburg-West Pomerania, is a state of Germany. Of the country's 16 states, Mecklenburg-Vorpommern ranks 14th in population, 6th in area, and 16th in population density. Schwerin is the state capital and Rostock is the largest city. Other major cities include Neubrandenburg, Stralsund, Greifswald, Wismar and Güstrow. The state of Mecklenburg-Vorpommern was established in 1945 after World War II through the merger of the historic regions of Mecklenburg and the Prussian Western Pomerania by the Soviet military administration in Allied-occupied Germany. Mecklenburg-Vorpommern became part of the German Democratic Republic in 1947, but was dissolved in 1952 during administrative reforms and its territory divided into the districts of Rostock, Schwerin, and Neubrandenburg. Mecklenburg-Vorpommern was re-established in 1990 following German reunification, and became one of the Federal Republic of Germany's new states. Mecklenburg-Vorpommern's coastline on the Baltic Sea features many holiday resorts and much unspoilt nature, including the islands such as Rügen and Usedom, as well as the Mecklenburg Lake District, making the state one of Germany's leading tourist destinations. Three of Germany's fourteen national parks, as well as several hundred nature conservation areas, are in Mecklenburg-Vorpommern. The University of Rostock, established in 1419, and the University of Greifswald, established in 1456, are among the oldest universities in Europe. Mecklenburg-Vorpommern was the site of the 33rd G8 summit in 2007. The full name in German is pronounced [ˈmeːklənbʊɐ̯k ˈfoɐ̯pɔmɐn]. Sometimes, Mecklenburg is pronounced [ˈmɛklənbʊɐ̯k]. This is because the digraph <ck> marks a preceding short vowel in High German. Mecklenburg however is within the historical Low German language area, and the "c" appeared in its name during the period of transition to Standard, High German usage (Low German authors wrote the name Meklenborg or Męklenborg, depicting proper Low German pronunciation, which itself was a syncope of Middle Low German Mekelenborg). The introduction of the "c" is explained as follows: Either the "c" signals the stretched pronunciation of the preceding "e" (Dehnungs-c), or it signals the pronunciation of the subsequent "k" as an occlusive [k] to prevent it from falsely being rendered as a fricative [χ] following a Low German trend. Another explanation is that the "c" comes from a mannerism in High German officialese of writing unnecessary letters, a so-called Letternhäufelung (lit. : letter accumulation, as was done sometimes in English with words such as "doubt"). In the aftermath of the Second World War and German reunification in 1990, the state was constituted from the historic region of Mecklenburg and Western Pomerania, both of which had long and rich independent histories. Along the coast, Vikings and Slavs established trade posts like Reric, Ralswiek and Menzlin. In the 12th century, Mecklenburg and Vorpommern were conquered by Henry the Lion and incorporated into the Duchy of Saxony, joining the Holy Roman Empire in the 1180s. Parts of Mecklenburg-Vorpommern was settled with Germans in the Ostsiedlung process, starting in the 12th century. In the late 12th century, Henry the Lion, Duke of the Saxons, conquered the Obotrites, subjugated its Nikloting dynasty, and Christianized its people. In the course of time, German monks, nobility, peasants and traders arrived to settle here. After the 12th century, the territory remained stable and relatively independent of its neighbours; one of the few German territories for which this is true. Mecklenburg first became a duchy of the Holy Roman Empire in 1348. Though later partitioned and re-partitioned within the same dynasty, Mecklenburg always shared a common history and identity. The states of Mecklenburg-Schwerin and Mecklenburg-Strelitz became Grand Duchies in 1815, and in 1870 they voluntarily joined the new German Empire, while retaining their own internal autonomy. After the First World War and the abdication of the German Kaiser, the monarchies of the duchies were abolished and republican governments of both Mecklenburg states were established, until the Nazi government merged the two states into a unified state of Mecklenburg [de], a virtually meaningless administrative decision under the centralised regime. Constituent regions and districts of the state, including the border of the historical Mecklenburg and Western Pomerania regions. The state's Baltic Sea coast is about 2,000 km long and features several islands, most notably Germany's two biggest islands Rügen and Usedom, but also a number of smaller islands such as Hiddensee and Poel. Mecklenburg-Vorpommern's varied coastline also has many peninsulas such as Fischland-Darß-Zingst and various lagoons (also known as Bodden or Haff). A total of 283 nature reserves, 110 landscape reserves and three of Germany's fourteen national parks are scattered all over the state. Over the centuries, Mecklenburg and Vorpommern have developed and maintained strong regional cultures. It can generally be described as North German and has similar linguistic and historic characteristics to other north German states, such as Schleswig-Holstein and Sweden. People in Vorpommern, as a result of that territory being a former province of Prussia, tend to look slightly more towards Berlin and Brandenburg than people in Mecklenburg would. Today the vast majority of people speak Standard German; a few centuries ago most people spoke Low German (German: Plattdeutsch or Niederdeutsch), a dialect that is still kept alive within various communities and cultural events. Following the Reformation, led in Germany by Martin Luther, as well as a period of Swedish rule, the traditional faith in Mecklenburg-Vorpommern is Protestantism, specifically Lutheranism. There are also a number of Catholics and people of other faiths. The Schwerin Palace, seat of the Landtag of Mecklenburg-Vorpommern, is one of more than 2,000 palaces and castles in the state. The last election of the Landtag of Mecklenburg-Vorpommern took place on 4 September 2016. The Grand coalition of SPD and CDU which took office after the 2006 election, was returned with a decreased majority. 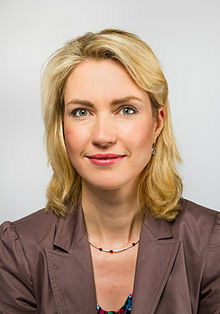 The Landtag has been led by Minister President Manuela Schwesig since 2017. Mecklenburg-Vorpommern is the least densely populated and least industrial German state, being the sixth largest in area, but only the 14th in population. The unemployment rate has gone down to 10.7% (September 2012). Formerly, it has been negatively affected by the breakdown of non-competitive former GDR industries after the German reunification in the 1990s. Now it is the lowest in more than 15 years while the economy is growing and the number of jobs is increasing continually. Growing sectors are biotechnology, information technology, life sciences, maritime industry and tourist services. In Mecklenburg-Vorpommern, approximately 732,200 people were gainfully employed in 2008 with 657,100 of them were white and blue collar workers. About 4,200 new jobs were created in 2007. Employees worked an average of 1,455 hours a year. The number of self-employed did not change in 2008. Three out of every four of all workers are employed in the service sector. In October 2018 the unemployment rate stood at 7.1% and was the third highest rate in Germany. V2 rocket replica in Peenemünde. These rockets were the first man-made objects to reach space. ^ "Regional GDP per capita in the EU28 in 2013". Archived from the original on 2015-11-06. Retrieved 2015-09-10. ^ a b c "Branche mit Zukunft". Die Welt (in German). 2009-05-07. Retrieved 2009-05-08. ^ "(PDF) Visitor nos. at public theatres in M-V" (PDF). Archived (PDF) from the original on 2013-10-16. ^ "University of Applied Sciences: fh-mittelstand.de". Archived from the original on 2015-08-15. Retrieved 2015-07-27. ^ "Fachhochschule Stralsund - University of Applied Science". Archived from the original on 2015-03-04. ^ "University NB: Hochschule Neubrandenburg". Archived from the original on 2012-10-08. ^ "FH Güstrow". Archived from the original on 2012-10-10. ^ a b c d e "State Parliament". Mecklenburg-Vorpommern. Archived from the original on April 2, 2011. Retrieved March 30, 2011. ^ Mecklenburg-Vorpommern, State Portal. "Homepage - State Portal Mecklenburg-Vorpommern". Archived from the original on 2011-07-20. ^ "Politik - News - WELT". DIE WELT. Retrieved 1 May 2018. ^ "2016-08". Archived from the original on 2012-11-04. ^ "Employment and Labour Market". Mecklenburg-Vorpommern. Archived from the original on March 7, 2011. Retrieved March 30, 2011. ^ "Festspiele Mecklenburg-Vorpommern". Archived from the original on 2012-10-19.